Charles Darwin University’s Yulara Centre has been a hive of activity, with students continuing to enrol in many courses. CDU hospitality lecturer Nick deSilva has been delivering wine training and the Responsible Service of Alcohol course to Voyages employees at Ayers Rock Resort. He has also been assessing CDU students enrolled in the certificates II and III in Hospitality (Operations) and Certificate IV in Hospitality (Supervision) at Ayers Rock and Kings Canyon Resorts. Yulara residents found out more about the Tertiary Enabling Program and studying at CDU when TEP coordinator Richard Head attended the Market Night organised by the Yulara Primary School Council recently. 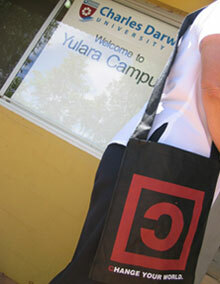 As a result of his visit, Jeska Murphy is the first person to enrol in TEP at Yulara through CDU. The University also has one student enrolled in a Diploma of Children’s Services at Yulara, working at the Yulara Childcare Centre. Lecturer Sue Tucker enrolled nine students in the Certificate IV in Assessment and Training during her recent visit to the Yulara Centre. Sue was able to show the students how to use Learnline, as materials for this course are being made available online for the first time this semester.